Summoner was one of my very first builds, and wanted to give it a go again... and it's so much fun! This time, I decided to go with a new version of an old build concept, Spectres and Zombies, with the difference of having Zombies dealing significant damage and not beeing just meat shield (wich they still are mind you). x Since we reserve 30% of life and use Necromantic Aegis (no block from shield), you need to move around to avoid big hits. We summon 5 Spectres, 11 zombies, an animated guardian and one golem; the spectres give us the clearing power, wich is huge, and with the right swap, do awesome dps against bosses; the zombies provide awesome single target dps, and help with clearing, specially on small, cluttered or narrow places, as spectres tend to get lost behind (you will use convocation a lot in those places). On a clearing scenario (not pushing hard), and depending on the spectres used, each one can ditch between 200k and 470k, and when doing bosses/shaper and the right swap, they can do between 500k and 830k each (again depending on the spectres raised). The zombies, on a clearing scenario do between 115k and 150k each (if vaal haste and offering are running), and on a boss scenario, when we apply shock (with vaal arc), they raise upto 225k each. Together they ditch a very decent amount of damage , and are quite hard to kill; zombies sit at 35-36k hp and spectres range between 12k (undying incinerators) and 23k (solar guards). In all contents, they almost never die if you pay attention. Defensively, you get 17% damage reduction from your zombies and chaos golem and, depending on your gear, you can reach a decent amount of EHP. With Midnight Bargain, I reach around 6.6k EHP, and that could be 7.9k without MB; this is with decent gear but not the best. This gives you a good survibability buffer. A few screenshots with numbers. Minion's Stats (Animated Guardian bonuses are not factored in). 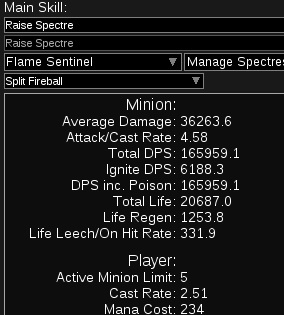 Our main DPS source is spectres, so our goal is to max the nuumber we can summon; for this, we have three required items, that will give +3 to spectres; if you want to have more EHP at the loss of dps you can ditch Midnight Bargain and get just +2 spectres. The BiS armor for the chest slot is Vis Mortis; your aim is to get a 6L, but with a 5L you can do all content too. Until you can get one, just use any armor or a Tabula Rasa. This will be your spectre 5L or 6L. Your aim is to get a rare pair with the +1 to spectres mod; until you can get them, you can use old Bones of Ullr. Midnight Bargain is our weapon of choice, the loss of 30% of life gives you a lot of benefits, as it boosts our build largely. IF you do not feel "safe" with it, you can use other minion weapons like "Severed in Sleep", "United in Dream"(v expensive), The Scourge or Earendel's Embrace. 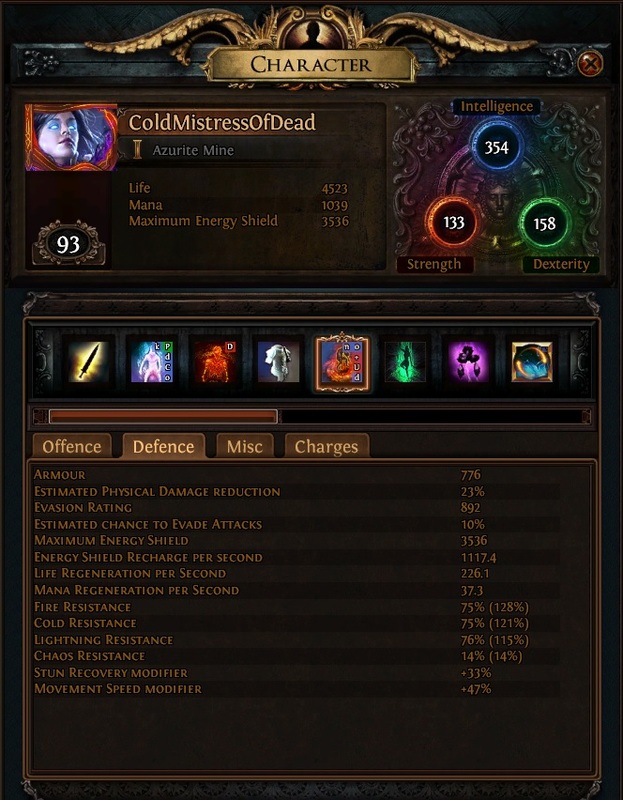 For our build to really shine, we look for a shaper helm with the mods "socketed gems are supported by Minion Life" and "... Minion Damage" and +2 level of socketed minion gems. Any extra is a bonus, but will probably skyrocket in price. The three of those mods, cost around 80 chaos and 1 exalt, if you go down to +1 to socketed minion gems, you can get one cheap, if you go for +3 it starts at 2.5ex. If you get those on a bone helmet... good luck trying to find ones ^^. Until you get that helm, you could use any other helmet for levelling, like Goldrim, and The Vertex or Geofri's Crest for the +1 to socketed gems. In here you will put your hungry Zombies. Astramentis, you will need it for your dex based skills as you will lack it from tree, specially on lower levels (can equip at lvl 20). When you can get your hands on a rare amulet with a high amount of dexterity, around 100+, and at least 50 life, it's a better option, but more expensive. As rings, you will want one Brinerot Mark where you will socket your Chaos Golem, this way you will gain 1% more phys damage reduction, and it will be nearly unkillable too (mine sits at nearly 40k hps plus 8k ES from the ring). The other ring will be an unset ring ideally, where you can socket your convocation; try to get life, energy shield, elemental resists you need and chaos resist on it. Here you will want a rare pair with Life, ES and resists; try and get good chaos resist here too. - Specials, those are imo the best ones: "Chance to blind with attacks", "Chance to hinder enemies on hit with spells", "Minions have % increased attack and cast speed if you or your minions killed recently"
If you can get your hands on the corruption "Corrupted Blood cannot be inflicted on you", "Minions deal % increased damage", "You cannot be Cursed with Silence", "You cannot be Hindered" or "You cannot be Maimed" on either of the unique jewels, thats a huge bonus. Nothing special here; life flasks, defensives and quicksilvers. I use two quicksilvers to fasten things up, but can use any other of your preference. Decided to move Flame Dash to secondary weapon set (as I rarely find the need to use it with Phase Run + Quicksilvers), and add Animated Guardian to the mix. Just give them the usual army booster uniques, and your minions will get a quite big boost, and he will be very hard to kill. With my setup and those items, AG has 20k hps. Recently tested to swap Summon Phantasm on kill instead of Conc Eff for clearing, and proved to be a nice addition. 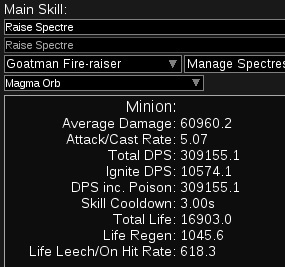 Doing so, each spectre lost around 70k dps, but each of the Phantasms summoned, is able to do around 77k dps, so it is a huge net gain in the end. For bosses I still swap Conc Eff in, but with Writhing Jar to keep the phantasms up, it could be still be better for bossing; just need to test it. As Phantasms do physical damage, they also will benefit from our Animated Guardian crafted Mask, wich applies to enemies a 9% increased phys damage taken. Why Concentrated Effect and not Controlled Destruction? simple, because Phantasms fire projectiles and would not benefit from Conc Eff. Personally, I like to have a mix of them, two for single target and three for clearing. The three that are best for clearing do still quite good single dps also with Slower Projectiles. 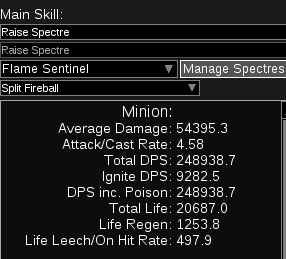 Spectre level IS very important. From level 62 (regular zone) to level 82 (maps or azurite mine) there is a factor of 7 in damage! How to get the higest level for your spectres? It's quite easy; just go to the normal zone where they are, get them with desecrate, and then go to the highest zone you can access. With Delve this is easy; enter your lowest location in your mine and cast desecrate there until you get the same spectres from the regular zone, and raise them. It is easy to get lvl 80+ spectres with this method. Apart from the Azurite Mine, there is maps; just open a high level map, tier 14+ and do same procedure there. When you run content with Physical Reflect, you need to swap Brutality for Ruthless and Concentrated Effect for Physical to Lightning, or your zombies will kill themselves. 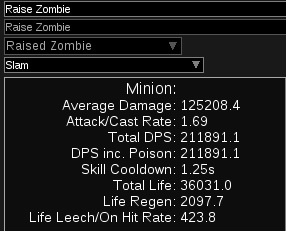 Raise Zombies lvl 20 and Empower lvl 3 work too, but you will loose around 24k dps for each one and nearly 7k hps on them. Both are good investments if you can afford them. We want Vaal Arc to be have a 100% shock chance against Bosses. Normal Arc has a 20% from quality. With spell echo, we ensure to hit packs with lightning to proc Elemental Equilibrium. Offering will boost greatly our minion's dps and Phase Run is our safe movement skill; we want both to last as much as possible! Phase Run can last a whooping 8 seconds if we use cast it with 3 frenzy charges, wich we will have thanks to Aegis + Victario's combo. Flame Dash lvl 20/20 will be our cliff saving movement skill (I rarely use it, as with Quicksilver + Phase run, you stand at 150% movement speed!). I decided to move it to swap weapons in case you need it, although you will need to buy a second Midnight Bargain, so you won't loose one of your spetres! Convocation lvl 20/20 on it's own in your unset ring, needed to summon your minion's to you in narrow places such as delves. Desecrate lvl 20, have it in your inventory to summon your zombies... they very rarely die! We will use Haste to boost our minion's dps and mobility (and our's too), discipline and arctic armour. We are the weak of the team, the more defensive layers we can get, the better. Chaos golem; you don't want it for dps, just for his defensive buff. Brinerot Mark is his home. Flame Dash, 20% quality needed here, as we want it to be reliably fast. Put it on the third slot from your shield. Why Commander before Flesh Binder? well, that's because we need that +20% to Ele resistances, much more than the 11% phys damage reduction during the leveling process. Kill All, it's our best option to get all we need on the tree. Matter of preference... wichever you like more. Personally am using Soul of Lunaris + Soul of Gruthkull, but have Arakaali and Ryslatha too if needed. Levelling with zombies is easier than ever... use raging spirits at the start to help them at earlier levels, but the progression curve is exponential with minions the more minion nodes you get! Made some corrections, added a few videos and added the use of Animated Guardian as our army damage support role. Your damage numbers are wrong. As of patch 3.0.0, Shock no longer scales its duration. Instead, its damage bonus is scaled. You must deal 10% of a monster's life in a single hit of Lightning to apply a 50% shock. To inflict the minimum of 1% shock, you must deal 0.2% of a monster's life. When you check "Is the enemy Shocked?" in Path of Building's Configuration tab, it applies the maximum 50% shock regardless of whether this is feasible for your build. Against a Boss, your Vaal Arc deals 5833 to 9716 lightning damage. With Vaal Arc's 100% increased shock effect, you can only inflict a 1% shock against a boss with 5,833,000 (11,666 / 0.002) to 9,716,000 (19,432 / 0.002) life. Against Guardians/Shaper this drops down to 4,537,000 to 7,557,000 life. You cannot shock Shaper or any of the Guardians. Against T15 bosses and below, who have 1-2.5 million life, you will get a couple percents out of shock, but nowhere near the max of 50% as shown in PoB. Also, Vaal Arc's shock lasts 4 seconds from its bonus shock duration, but has a soul gain prevention of 6 seconds and another 8.3 seconds (25 soul cost / 3 souls per sec) to generate enough souls to cast again if there are no adds. So against a single boss you can only keep the shock debuff up 28% of the time. This means it gets shocked at least the duration of that use, that is 5,2 seconds if vaal arc has 20% quality, 4 secs if none. Indeed, against bosses, this is used as a "burst damage", while the rest of the time, we really benefit from EE proc, wich is the build's real dps increaser. Your are welcome to watch Shaper's video and see how they perform without the need of shock though. Wrong. Crits also have 100% chance to shock, but that doesn't mean you are guaranteed to shock if you don't deal a minimum of 0.2% of the target's life with lightning damage. Anything below 1% shock is discarded. We've removed the minimum, so as long as you'd have a 1% effect with your Chill or Shock, the ailment will be displayed and will have an effect. Read GGG's own words about it here. Completely wrong. Are you thinking of Shocked Ground, such as from Vaal Lightning Trap? That is the only source of a guaranteed 20% shock, outside of an Elementalist. Wrong. The two sources of duration are additive, as both are Increases. It's 100% + 30%, not 100% x 30%. So with 20% quality on Vaal Arc, its shock will last 4.6 seconds. This means it'll be up for 32% of the time against a single boss. Not intending to discuss about shock mechanisms and behaviour in this thread ^^. With EE is more than enough to slaughter packs and kill bosses though ;). This isn't a discussion on shock, it is a correction of misinformation. 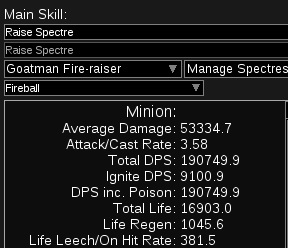 DPS numbers from PoB have gotten a bad rap as of late because too many people are posting builds with unrealistic or even outright impossible multipliers applied. At best, this is done out of ignorance or misunderstanding of mechanics; but at worst, it is dishonest. I understand you put time into your build, even compiling snips from PoB, to where you might feel resistant to believing me when I say you're wrong about something. However, I have shown the math and provided sources from the wiki, datamining from poeDB, and even GGG's own post as evidence to back up what I am telling you. To avoid and hand-wave all that away with a dismissive "not intending to discuss" makes you appear disingenuous. I understand you want more views on something you put effort into making, but clickbait numbers will be seen through by veterans and mislead new players, which will only harm your build in the long run. Good for you then if it makes you feel better; just ignore the numbers implying shock, it is of mimimal impact to the build. Not going to follow that route of disrespect you want to walk, so thats my last reply for you. How is my saying you're wrong about something that inflates your advertised DPS by 1.5x disrespectful? In any case, it doesn't matter if you talk to me or not. My posts are to inform anyone reading here. Your reaction to that is up to you. Slam for Zombies is misleading to use as their DPS, because PoB is multiplying the average hit by its attack rate without factoring in the 1.25 cooldown. That equals a cap of 0.8 attack rate. Their normal attack can miss and deals 31% less damage than Slam, so total Zombie DPS will be lower than what you're showing here. 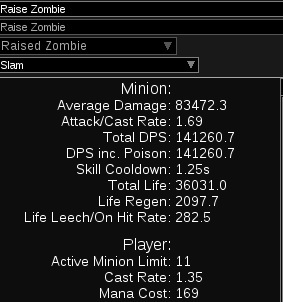 According to your Pastebin, the Zombie basic attack deals 58,375 DPS, or 642,125 with 11 Zombies. Slam would be 82,109 x 0.8 (cooldown) x 11 zombies = 722,559. Now here's where it gets complicated: You can't just add these two together, because Slam is replacing a normal attack, and it actually has 22% less attack speed, so it further displaces another normal attack. 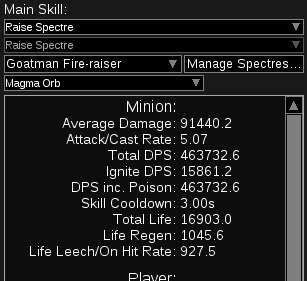 Quite a bit lower than the 1.5mil in the "[3.4] Old Spectre (1M - 3.7 M dps) + Zombies (1.5 M - 2.2 M dps) build" title.